I highly recommend this video of a lecture by Jeremy Deller presented by Situations UK. His background and practice form a welcome alternative to the cult of young, ‘bankable’ artists (he was 31 when he staged his first art show—in his parents’ house). He mentioned instances of his indifference to the contemporary art world’s reception and its isolation/self-regard, as well as being pleased when an art object lost its aestheticized status and returned to being an object. I also appreciated his candidness about failure, and its productive possibilities, as seen above. A few weeks back, I posted about an assignment for artists to describe their own dream group show. I came up with one version of my own dream group show—it’s local, site-specific and combines numerous interests. I was so excited by all the projects and artists, the only way I could keep my presentation under the six-minute limit was to read out a script of only keywords, and that’s what I’ll include here. Enjoy! And consider coming up with one of your own—it’s a fantastic, liberating exercise. but what you make happen. 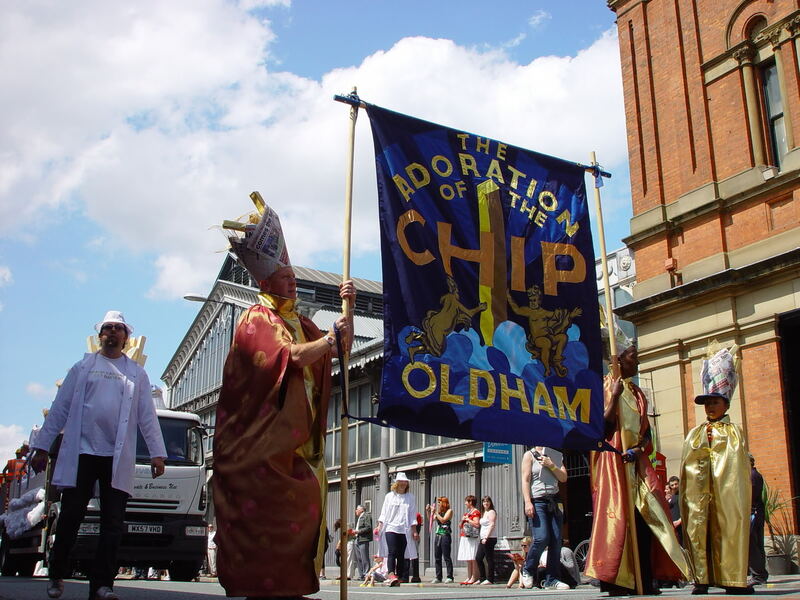 Contemporary groups working with a banner maker. Summer of public programming as grand opening. Map of the Proposed Queens Way. // Source: TheQueensWay.org. Present conditions of the Queens Way. // Source: TheQueensWay.org. I am not a natural optimist. Anxiety and rumination, humans’ natural states. Importance of access to clean, green open space. A society where women can go for a run in their own neighborhoods without fear. Improve quality of life for generations. Susan O’Malley, Community Advice, 2012. What advice would you give your 80-y-o self? 8? Transformed to spaces of light and color. Transition from gallery oriented art object to direct social engagement. Proposed exhibition copies as public sculptures. Artist mostly known for twee sign paintings on junk. 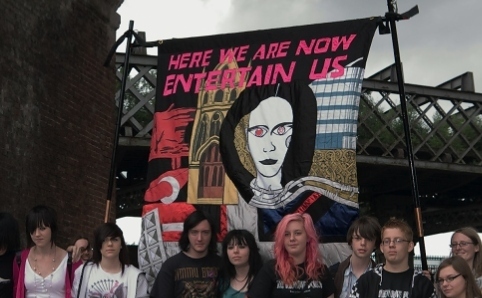 Opposition to cuts in Art Education in UK. Defense of accessibility of art education and therefore art. Artist mostly famous for wheat field in Lower Manhattan. Beautiful drawings of world maps. Michael Jones McKean, The Rainbow: Certain Principles of Light and Shapes Between Forms, 2012 // Source: therainbow.org. Curatorial influence of Jenns Hoffmann. Contemporary art alongside historic art and artifacts. Contextualizes art practice in wider cultural production. 7,000 fireworks in less than 60 seconds. James Turrell: A Retrospective is coming this summer, to be exhibited concurrently at three museums! This is super exciting. I love Turrell’s phenomenological light installations. They are very difficult to install and exhibit. Not to be missed! Jeremy Deller’s retrospective at the Hayward Gallery in London was a brilliant, daring move by curator Ralph Rugoff. I missed this show at the Philly ICA last fall (and it seems like NYC museums missed this opportunity). The show has continued on, however. Contemporary Art Museum, Saint Louis, MO. More Deller: The Guardian picked Joy in People for the sixth Best Art Exhibitions of 2012. Deller will represent the UK at this year’s Venice Biennale. art isn’t about what you make but what you make happen. but do you have to void one to validate the other? 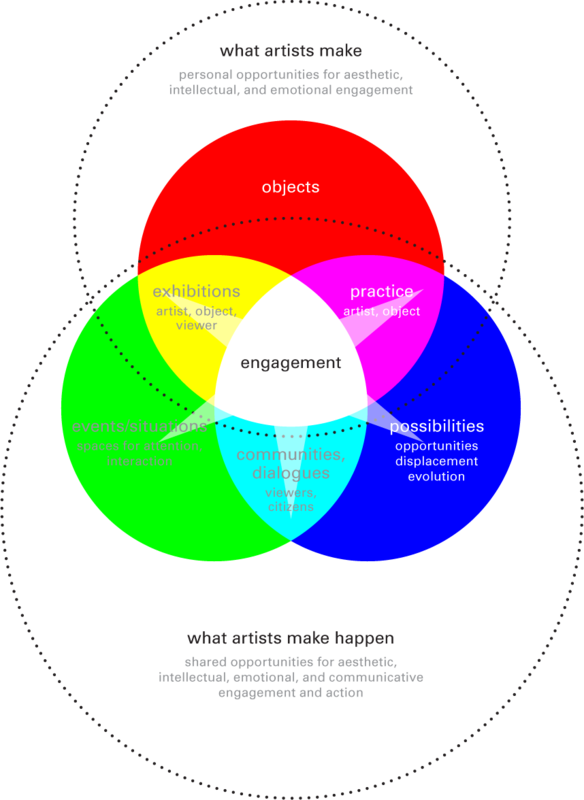 Christine Wong Yap, diagrammatic study about what artists make and what artists make happen: how objects, events/situations and possibilities intersect to create exhibitions, practice, communities, dialogues and engagement. Artists make objects. The very activity of manipulating materials with an openness to their possibilities is the development of our own practices. We use imagination, courage, and will to take creative risks and sustain activities and engagement that can lead to enjoyment and flow (see Mihaly Csikszentmihalyi, Flow). Many artists make exhibitions, which are events/situations for engagement between the artist and viewer via the object. So, largely, I think what artists make are objects, exhibitions, and practices that are opportunities for personal aesthetic, intellectual, and emotional engagement. (See Csikszentmihalyi and Rick E. Robinson’s The Art of Seeing for more on the four dimensions of aesthetic experience.) The engagement is personal—for artists, via our activity with objects and their display, and for viewers, via those objects displayed. What artists make happen, though, seems to expand beyond what artists make. Artists also make events/situations (which are not object-based exhibitions) happen. These are spaces—physical or psychological—for attention or interaction. Participatory projects, public interventions, and of course, happenings, are some examples. Some artists also make possibilities, and some artists make possibilities happen. Artists make creative possibilities happen in terms of their personal development (object + possibilities = practice). We also make creative possibilities happen in terms of the development of the field, when our object-possibilities are accepted into the cannon, and they shift what constitutes contemporary art, therefore advances knowledge (see Csikszentmihalyi, Creativity). In this case, what artists make happen is a result of what artists make. But artists can also make the field’s expansion and evolvement happen. We do this by creating events/situations with openness to possibilities—from new opportunities for artists, spaces, viewers, and interactions, to cultivating new art worlds and displacing old ones. When other artists or viewers attend these events/situations with reciprocal openness, new communities and dialogues can emerge. For example, Obsolete Californias, by Shipping and Receiving (the moniker of collaborative duo Torreya Cummings and Heather Smith) was part-exhibition, part-event space/social space/store/wrestling mat. Amanda Curreri‘s Jean Genet in the Aunque is a conversation in the form of a participatory reading; parts are available for all attendees. * These events/situations were more like platforms for artists and viewers to enact possibilities alongside each other. In this way, artist and viewer roles can be shed for the roles of citizens of temporary communities, or dialogists. So what artists make happen are opportunities for shared aesthetic, intellectual, emotional, and communicative engagement and action. The engagement is shared, as there is mutual investment of attention and space for cooperative action. This week, articles in the Village Voice and the NY Times bemoaned the vast influx of money in art. Art auctions, art fairs, and mega-galleries that show works collected by the 1% are part of the art world, but equating them with the art world (as the Voice writer did) or only reviewing those exhibitions and fairs (as some NYT writers tend) are mistakes. As Csikszentmihalyi points out, our most valuable currency is not money, but psychic energy—in other words, our attentions. There are multiple art worlds. In mine, art auctions, secondary markets, and multi-million dollar transactions are on the periphery. I focus my attention on the center, which is abundant with artists, especially those who make things happen. *Included in The Aunque, on now through February 16 at Romer Young Gallery, San Francisco, CA. Wow! Isn’t this grand? Vanessa Thorpe’s article, “Feelgood art: the pick-me-up to get us through an age of anxiety,” appeared on Guardian.co.uk yesterday. I’m thrilled to bits to hear about artists considering psychology from non-negative attitudes, as well as the influence of positive psychology expanding into the arts and humanities, but Thorpe’s article is not that. I think Thorpe set up an annoying happy face in the headline and lede only to slap it down in the article. It’s simple-minded to call artwork concerning positive affect “feelgood” and “pick-me-up.” It’s a misinterpretation of Deller, whose work has been consistently class-aware and courageous. Thorpe acknowledges as much, after rankling readers into mild outrage in their aversion to unabashed sentiment. Desparate, newsworthi-fying journalese. Deller’s a brilliant artist, I love his work and thoughtful approach to developing projects and working with people. Plus, the Hayward is an amazing space. I really wish I could pop over to the Southbank Centre this spring for this! There’s something fun and funny about live houseplants in contemporary artworks. Live plants takes the edge off of self-serious contemporary art. By growing or dying, plants challenge the static condition of art-hood and the illusion of timelessness. Their standardized pots clue the viewer in to their status as ready-mades. By referencing consumer culture, decoration and domestic life, there is an appealing familiarity. Houseplants strike me as unpretentious and welcoming. Simon & Tom Bloor: As Long As It Lasts. Installation view, Eastside Projects, Birmingham, UK. Mostly trees, but there is a houseplant in the background. Image Source: Eastside Projects. Down Over Up is on view at the Fruitmarket Gallery in Edinburgh through October 31, 2010.
at Magnan Metz Gallery in Chelsea, NY, through October 23, 2010. Tiny image, sorry. Image source: Paper Monument. I have a fantasy of lighting a concert with some tropical plants on turntables and a few lights. Brilliant! Read more from the joint interview between Deller and David Byrne (awesome just got awesomer) at ArtInfo.com.